I don’t have that is just the perfect answer to anyone is asking you for money. So it isn’t a biggie to compare MONEY to HIV because nobody wants to have HIV. Here you have Trump telling the World that Money be like HIV in Nigeria. This is just our comic relief picture for the weekend. 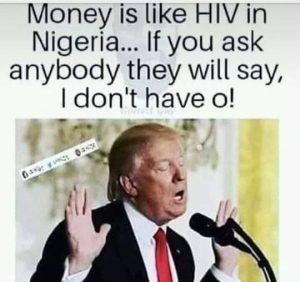 Money be like HIV in Nigeria so let’s collectively cast and bound.